I am always so hesitant about making crepes, but then I make them, and I’m like, “that wasn’t hard at all!” These were pretty easy and were really good, but I had one problem with them: not enough filling! I knew I wasn’t going to have enough, so when I started filling the crepes, I didn’t put much in them at all, and I STILL had two crepes left over. Those I just filled with leftover Gruyere. The next time I make these, I will double the filling. Also, these would be good with a little sauce on top, maybe a creamy mushroom sauce or something? After one bite of these, my husband said “You should make crepes more often!” I agree! 1. To prepare crepes, weigh or lightly spoon flour into dry measuring cups; level with a knife. Combine milk, rosemary, 1/4 teaspoon salt, and eggs in a blender; process until smooth. Add flour; process until smooth, scraping sides. With blender on, add 1 tablespoon oil and butter. Pour batter into a medium bowl. Refrigerate 15 minutes. 2. Heat an 8-inch crepe pan or nonstick skillet over medium-high heat. Place 1 tablespoon oil in a small bowl. Brush a thin layer of oil to coat bottom of pan. Pour 1/4 cup batter into center of pan; quickly tilt pan in all directions so batter covers pan with a thin film. Cook about 1 minute. Carefully lift edge of crepe with a spatula to test for doneness. Turn crepe over when it can be shaken loose from the pan and the underside is lightly browned; cook 30 seconds. Place crepe on a clean towel; keep warm. Repeat procedure 7 times with remaining batter and oil. Stack crepes between single layers of paper towels to prevent sticking. 3. To prepare filling, heat a large nonstick skillet over medium-high heat. Add 1 teaspoon oil to pan; swirl to coat. Add onion; cook 3 minutes. Reduce heat to low; cook 15 minutes or until browned, stirring occasionally. Add 2 tablespoons water, garlic, and Swiss chard; cook 5 minutes or until chard wilts. Add pine nuts, pepper, 1/4 teaspoon salt, and cream cheese, stirring until cream cheese melts. Remove from heat. 4. Preheat broiler to high. Place oven rack 6 inches below broiler. 5. Spoon 1/4 cup chard mixture in center of each crepe; roll up. 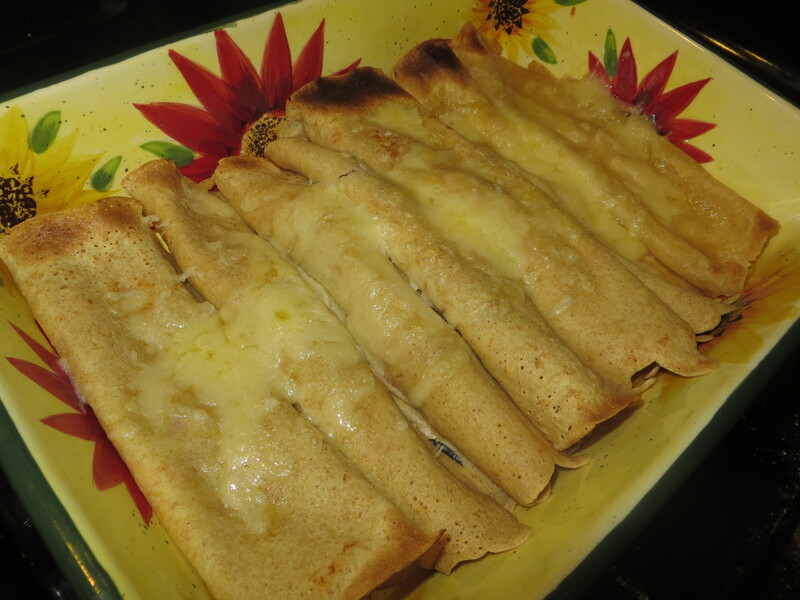 Arrange filled crepes, seam sides down, in an 8-inch square glass or ceramic baking dish coated with cooking spray. Sprinkle evenly with Gruyère cheese. Broil 3 minutes or until cheese is bubbly. Serve immediately. This entry was posted in main dish and tagged Cooking Light, cream cheese, crepes, onion, pine nuts, rosemary, Swiss chard, vegetarian, whole-wheat pastry flour. Bookmark the permalink.